Average Height	: 14" - 18"
Average Weight	: 25 - 40 lbs. Just after the turn of the 20th century, Alexander White of Spartanburg, South Carolina, saw a small brown Spaniel-type dog wandering around after church service. This dog appeared to be a stray and Mr. White decided to take the dog home with him. He discovered that the dog had great hunting abilities. This stray had a wonderful bird sense. Alexander gave the dog to his hunting partner L. Whitaker Boykin. The dog was a male and he was given the name "Dumpy." The Boykin Spaniel breed has evolved from this one dog, with crosses to American Water Spaniels, Springer Spaniels, Pointers and Chesapeake Bay Retrievers. It is used as a hardy retriever of upland birds as well as water fowl. 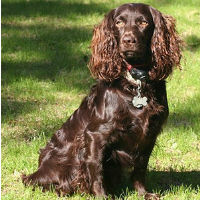 The Boykin Spaniel was originally bred in the early 1900’s in South Carolina for use in hunting ducks and wild turkey. With selective breeding, the Boykin Spaniel has become a versatile hunting dog. The Boykin is well known for its good temperament and are very sociable and family-oriented. They are inherently active dogs and are smart enough to amuse themselves if they get bored or are left alone for long periods of time. On September 1, 1984 the Boykin Spaniel was selected as the State Dog of South Carolina. The Boykin Spaniel is indeed a multi-purpose dog excelling in the field as well as the home. The Boykin Spaniel is popular in the southern United States among bird hunters. •	Friendly, social & inquisitive. •	Do not make good watchdogs. •	With their flat, wavy & curly Coats they need grooming at least 2x/week to prevent shedding. •	An active breed, they require daily exercise. •	Great Companion & Hunting Dog. •	Love affection and attention. •	They respond well to training that is fun and they are eager to please their human companions.